I am joining Celia over at Fig Jam and Lime Cordial again for another In My Kitchen post. What a busy month we had in September. First my mom returned from a trip to Europe. She and my dad went to Amsterdam and then traveled in Germany. My mom went to an art class in Berlin and did some shopping there. Among the goodies she bought were chocolate for us. 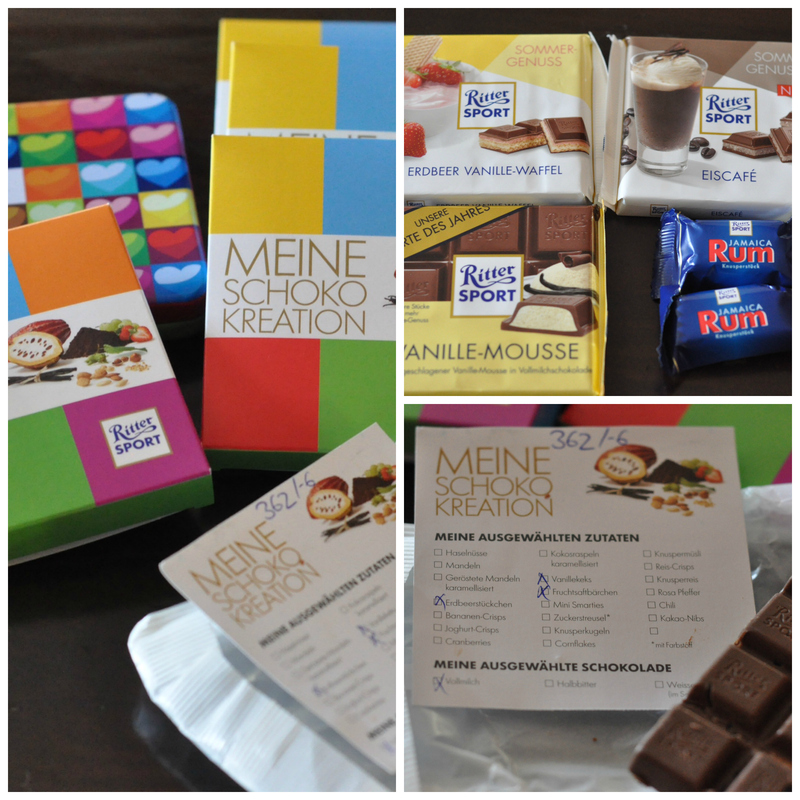 She went to the Ritter Sport store where you can design your own chocolate bar. Imagine the fun the boys would have there!! She brought back a custom bar for each of the boys and one for me and Josh along with some Jamaican rum chocolates. My friend Jens also sent some seasonal flavors home with my dad, thanks a bunch! Yummy! My mom also got me a bunch of glasses and some cookie cutters. I still need to perfect the thickness of the cookie dough to get the best imprint design. I haven’t even decided how to use the glasses yet, but I’m sure you’ll see them at some point on the blog again! I also love the little bottles and little pottery crock. We also had two birthdays in September. Josh turned 40 and had red velvet cake, with an alien courtesy of the boys! Sean turned 4 and had an apple cake with caramel frosting and chocolate sprinkle dinosaurs! Sean has also been quite the helper in the kitchen this month. He enjoys helping mommy while his brothers are at school. 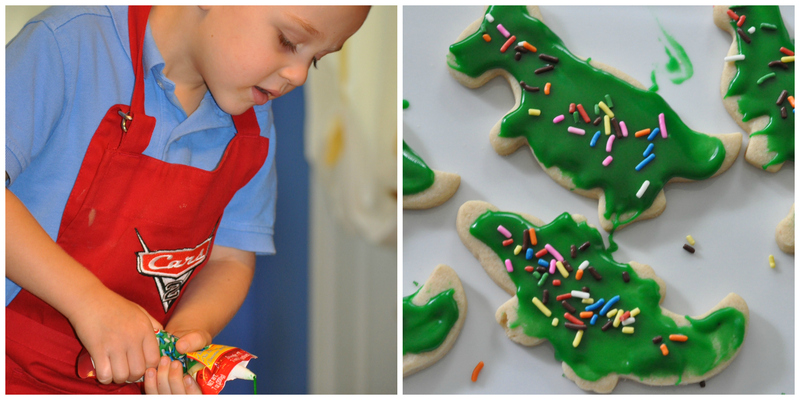 I made him some dinosaur cookies for his birthday and let him decorate them all by himself. He was over the moon THRILLED! Normally I do the decorating since I want them to look nice but this year I figured we would eat them ourselves and Sean could have at it. And finally here is my new cutting board from Michael’s Woodcraft. I absolutely adore it and can’t wait to use it more on the blog and for entertaining. It is pictured with two baking pumpkins I bought at Trader Joe’s yesterday. I don’t have high hopes of my pumpkin plants producing anything and yesterday was the first day of October….I can’t wait any longer and must begin baking with pumpkin! What is happening in your kitchen? For a link to all the other In My Kitchen posts head on over to Celia @ Fig Jam and Lime Cordial. This entry was posted in In My Kitchen and tagged birthday cakes, cutting board, Fig Jam and Lime Cordial, german chocolate, In My Kitchen, Michael's Woodcraft, Ritter Sport on October 3, 2014 by Gretchen. Hi Gretchen! Nice post and thank you for picturing the board with a link back to my site!! I sure hope you are enjoying the board! 🙂 I had to make my wife one almost exactly like it because she loved it so much! thanks again! I am not surprised you had to make another one! It is absolutely and I would have my husband make me one too! Thanks again for such a gorgeous board. Wow, custom chocolate bars, the mind boggles. I love red velvet cake but I’ve never had it with ‘alien’ before! Thanks for playing with us! I would love to make my own custom chocolate bar as well! As for the alien on the cake, leave it to a six year old to come up with that! Thanks for stopping by. Hi Gretchen, those green dinosaurs are out there! 🙂 Sean did a fab job. I love your chopping board. He certainly had fun decorating them! I suppose he is going to expect to help decorate Christmas cookies now too! I love that board too, I don’t even want to chop anything on it. Thanks for stopping by. I wish we had someplace here to design your own chocolate bar, it would be so fun! Sean certainly had fun with the cookies and I’m sure there will be more soon as Jack has a birthday coming up! Thanks for stopping by. I can always count on my mom to bring great things back. She tried the flea markets but couldn’t find anything fun there so ended up with glasses. Somehow she managed to get it home safely! The other cookie cutter is a teapot, absolutely adorable! Thanks for stopping by. What a wonderful memory of Paris! Food creates some of the best memories! The chopping board is definitely one of my favorites now. Thanks for stopping by. It has been busy! When we made the dinos I doubled the recipe, made pumpkin cookies for the October birthday boy and froze them along with some of the dough for future fun! I know, doesn’t customized chocolate sound fun?! Thanks for popping by. Awesome dinosaurs! I would love to design my own chocolate bars. Thanks! He certainly had a blast decorating the dinosaurs. Maybe I’ll get to that store someday and make my own chocolate bar too! Thanks for popping by my kitchen. He was very proud, more decorating is certainly in his future! His brothers too. Thanks for taking a look in my kitchen. The alien certainly didn’t scare anybody off from eating the cake! I am lucky that all the boys like to help in the kitchen, though their version of help isn’t always helpful! Thanks for stopping by. I love it too! I could have used it a couple years ago when one of the boys had a bike themed birthday party! Thanks for stopping by. G’day Love the cookie cutters and your red velvet cake! Happy Birthday Josh and Sean too! Thank you for stopping by! The cookie cutters were fun, next month maybe I will perfect the dough thickness and use the teapot cutter. I planted four varieties of baking pumpkins, unfortunately they aren’t doing well. The cookies were certainly a fun adventure for the little guy to decorate. I so want to go to Berlin now just to make my own chocolate bar. I must research, certainly there must be someplace closer where I can do this! Never enough glasses! I look forward to using them soon. Sean had a blast decorating, the piping bag may have found its way in his mouth too! Maybe next month I’ll have a good imprint of the teapot cookie cutter to post. Thanks for hosting and peeking in my kitchen. I’d like to design my own chocolate bar. The apple cake with caramel frosting looks very tempting (though possibly without the dinosaurs). I am going to look into designing my own chocolate bar closer to home! The cake is definitely delicious, without the chocolate dinosaurs. Sometimes I just have to let the little guy have his way, especially on his birthday! Thanks for stopping by. I do enjoy these IMK posts for they always bring a smile. This time, I started grinning as soon as I saw the dinosaur cookies. Way to go, Mom! I also enjoy the IMK posts. The dinosaur cookies were a huge hit. Mathis week it will be pumpkin cookies for the next birthday boy! I enjoyed seeing all the chocolates and kitchenware you received this month. I especially love that bicycle cookie cutter. 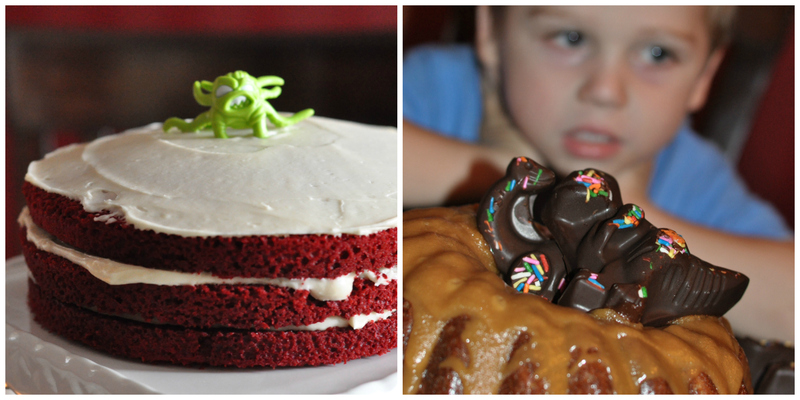 Both cakes look delicious, and your little one is so sweet to help you out in the kitchen. He looks like a natural! Your cutting board just reminded me I have to go over to Michael’s woodcraft and get my own board! I am definitely enjoying the cookie cutter and look forward to testing,out the teapot shape. The chocolate is still around too, only because I hide it from everyone The cutting board is truly beautiful, go to Michael’s site now and find one for yourself. What a wonderful kitchen full of treats and little boys. I love your cookie cutters. i might just have to have one for Tour de France watching. Thanks! I can’t wait until Tour de France now! Maybe the boys will decorate,the bike cookies too, yellow, red polka dots, green and white. They would love that. Thank for sharing, Designing own chocolate is such a great idea. Sean looks double cool in a an apron I hope he had a wonderful birthday. 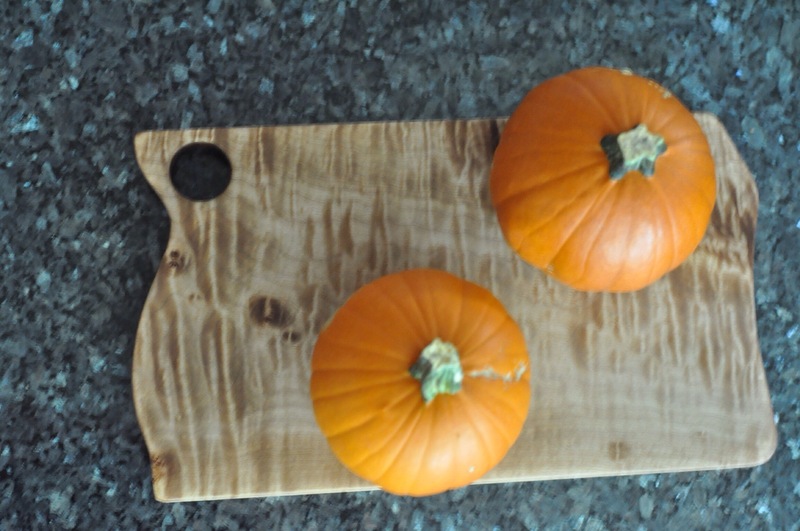 I love the new kitchen board the colour blends so well with the pumpkins. Enjoy the rest of the weekend!